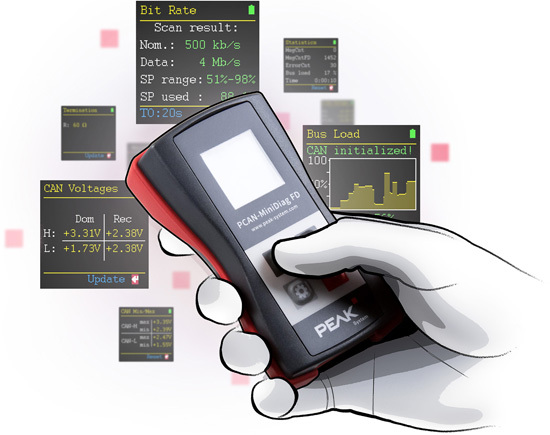 Peak-System’s diagnostic device PCAN-Minidiag FD is now available. With the help of numerous functions, the device can be used to check Classical CAN and CAN FD networks from one hand. The German company has published the handheld device for the basic diagnosis and checking of Classical CAN and CAN FD networks. The battery-powered device has functions which show, for example, the termination, bus load, message, and error counters as well as the levels at the CAN connection. Users can access any CAN network in a matter of seconds with the transmission rate detection. More precisely, bit timing measurements are used to determine the nominal bit rate for Classical CAN and the data bit rate for CAN FD. The product can be operated with one hand due to its size of 122 mm x 69 mm x 44 mm and fits into any conventional trouser or jacket pocket. The device is suitable for service technicians and developers who want to access unknown CAN networks in vehicles, machines, or industrial facilities and perform diagnostics. The PCAN-Minidiag FD has a D-Sub connector, an Oled display, a membrane keyboard with four keys, and a housing with increased IP42 ingress protection.